I've walked pass this Chinese eatery on route to Queen Victoria Market many times. It never dawned on me to sample the fare until a fateful day when the rain stopped my tracks. I've been informed that Wing Loong Chinese Restaurant is popular with the student population for its convenient location, fast service and affordable prices. A step into the restaurant brought back memories of side street restaurants in Hong Kong. This Melbourne version has the busy atmosphere of a "cha chan teng" (local cafe in the Cantonese language) like Tsui Wah Restaurant or Brother Seven Cafe, minus all the gaudy food photos and furniture. Importantly, there is no sardine-in-a-can seating common in many Melbourne eateries. The menu is full of old-school and commonplace Cantonese fare especially the extensive list of one-meal rice and noodles dishes. Just the kind you would find in similar streetside eateries dotting Mongkok in Kowloon. After considering the suggestions from the friendly waitress on the most sellable dishes, I decide to sample a rice and noodle dish. Now for the taste test. The Roast Duck, Roast Pork and Fried Rice with Egg on Rice for $9.50 was a whopper. There was an entire duck leg, handful of sliced "char siew" and 2 fried eggs (not egg as per the menu) sitting on greens and rice. Although the roast duck was not as crispy and fragrant as the version at BBQ King in Sydney, the meat was still tender and flavoursome. The barbequed pork slices were still moist and the voluminous rice soaked up all the sauce. The Braised Beef Noodle Soup at $8 was equally sizeable - a large bowl of beef brisket pieces, thin egg noodles and vegetables swimming in a large bowl of soup. The beef pieces were tasty morsels of braised fat, muscle and meat, and the noodles were not limp. The only regret was the flavoured-down starch-thicken soup. I can understand why Wing Loong Chinese Restaurant is popular with students, families and folks working around the area. While the Cantonese food is not the most delicious in Melbourne, this eatery offers spacious seating and serves up sizeable portions of comfort Hong Kong dishes for less than $10. Why? 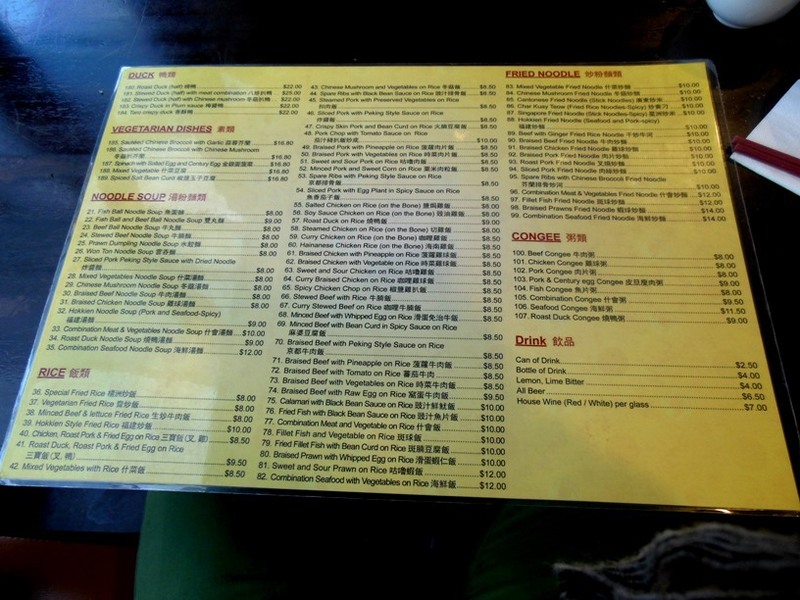 Where can you find cheap and large portions of Cantonese comfort food in Melbourne? I'm amazed at the price of that rice dish considering how big it is.